Mr. Spaulding is also active with symphonic choruses, conducting at the Grant Park Music Festival in Chicago and the MDR Chorus in Leipzig, where he will return in 2013 and 2014. He recently worked with the RIAS-Chamberchorus and is also known for his successes at the Royal Opera House in Copenhagen and the Teatro Lirico di Cagliari, the capital city of Sardinia. Permanent positions also include the Volksoper Wien and the National Theater in Mannheim. William Spaulding is also in demand as an orchestral and opera conductor. His successes on the podium with Carmina Burana, La Traviata, and Verdi’s Requiem earned him the additional title of Kapellmeister in 2012. This year he will conduct Carmen and Nabucco, all at the Deutsche Oper Berlin. Other venues include the Volksoper Wien and theNationaltheater Mannheim. Concert appearances include Beethoven’s Ninth Symphony at the Mainfranken Theater Würzburg. In 2014 he conducted the Jerusalem Symphony Orchestra in Tel Aviv and Jerusalem. On the program: Faure/Requiem, Stravinsky/Psalmensinfonie and Debussy/Prélude à l’apres-midi d’un faune. 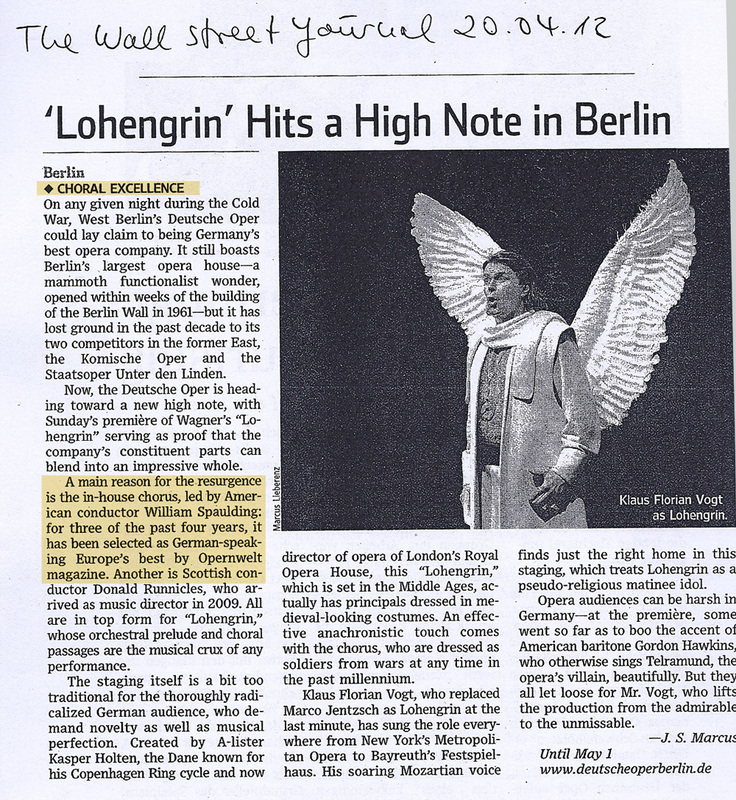 In January 2015 he conducted Il Barbiere di Seviglia at the Deutsche Oper Berlin. Upcoming performances include La Boheme, again at the Deutsche Oper Berlin. Maestro Spaulding began his studies at the University of Maryland in the piano class of Santiago Rodriguez, and received a Study Abroad exchange scholarship in his sophomore year, eventually earning his conducting degrees at the Hochschule in Vienna, Austria (Alma Mater of Claudio Abbado and Zubin Meta). He then began his career in provincial German opera houses, returning to Vienna in 1997 as Associate Chorus Master at the Volksoper Wien. There the extraordinary success of his preparation of “Boris Godunov” earned him an invitation to the Gran Teatre del Liceu inBarcelona, where he became the Principal Chorus Master for a period of five years. The conductor’s educational credentials have been evaluated by World Education Services, Inc. in New York City as follows: Bachelor’s and Master’s Degree in Orchestral Conducting from the University of Music and Performing Arts in Vienna; GPA 3.97. He has been a citizen of the United States without interruption since his birth in Washington, DC. Berlins Major Klaus Wowereit and his undersecretary for artistic affairs André Schmitz appointed William Spaulding in 2010 member of the jury for supporting and funding choruses in Berlin. In 2013 the Deutsche Musikrat appointed him juror for their conductor-forum.